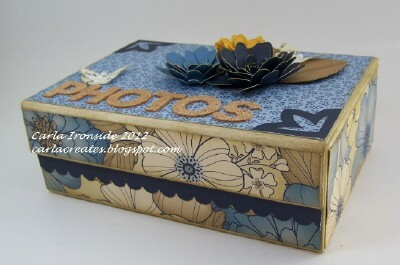 Here is a photo box I recently decorated with CTMH's new "Pemberley" paper line. Love how this turned out! The leaves, flowers, and decorative corners were all cut with the CTMH Cricut cartridge "Art Philosophy". Aren't the 3D flowers awesome? So fun! 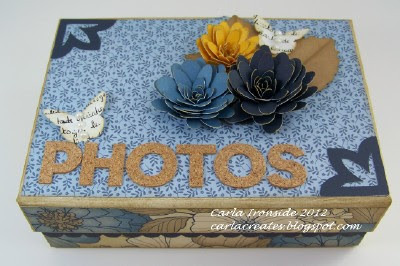 These little boxes are great for gift giving - they can be used as card boxes, photo boxes, desk organizers, or just a holding place for trinkets & treasures. This is beautiful Carla. I love this paper pack! This is gorgeous! I love the flowers and the paper line! So rich! I'm loving my CTMH products I won Carla. I'm addicted to the stitching stamps!! Thanks again!